Find for </b:skin> - Paste the following directly below </b:skin> - Change the address in Line 1 to the address of your page. Again, don't forget to change the address in Line 1 to the address of your page. If you want to apply the tweak to more than a page, just copy and paste another set of similar code below the first one, and place the other page's address on the second code. If you want to apply the tweak to all of your static pages, see the Bonus section below. That will be all folks, now go have fun. This is brilliant thank you for your great work! @UnmotheredChild: You're welcome. Glad it worked. Cheers. Works like butter!!! Thank you so much! I've applied the code in its proper place but nothing has changed. I was sure to change the address and place it after b:skin...Have you any idea what I could be doing incorrectly? @Elizabeth: Glad it worked. And you're welcome. Cheers. It worked for me.thanks.if u do everything right as mentioned u will succeed. awesome tutorial! is there any way to hide just one of the sidebars and leave the other one visible? Don't forget to change the address. Cheers. yay it worked!! and would it be possible to center the titles of individual static pages? thanks a lot and sorry about all the questions! @Life: Here you go. Probably I'll write a post on this answer - running out of ideas to blog about. I did everythigng as I was supposed to but it still doesn't work.. could you have a look at my blog, too? @jessica: You seem to only have the mainbar in your blog, and no sidebars at all. Have you tried going to Dashboard - Design - Template Designer - Adjust Widths - and adjust your width there, instead of trying to hide it? Usually fashion blogs like yours use stretch template, I'm not sure what's the deal with that. But if you want to have maximum width like one of the fashion blogs that I'm referring to, you might wanna have a look into that. You can get a stretch template by going to Dashboard - Design - Edit HTML - Select Layout Template - Minima Stretch. But beware, this will overwrite your current template. Cheers and God bless. I believe I do not have a designer template and would love the html code to not have sidebars for this page. I appreciate your help! @Powered By Coupons: I can't see any sidebars in that page. I assume it worked? I have a problem with the width of the page after having removed the sidebar. I used the code you gave to @MAZ-ONE instead of the first one as the latter did not work. The code works, but the main width is not maximized. Have I done something wrong? thanks a lot, it works perfectly. You're my hero! @Ainolopa: Yay! You're welcome, cheers. @H A M M E R: You're welcome mate. Er, looks like I need a different code, too. 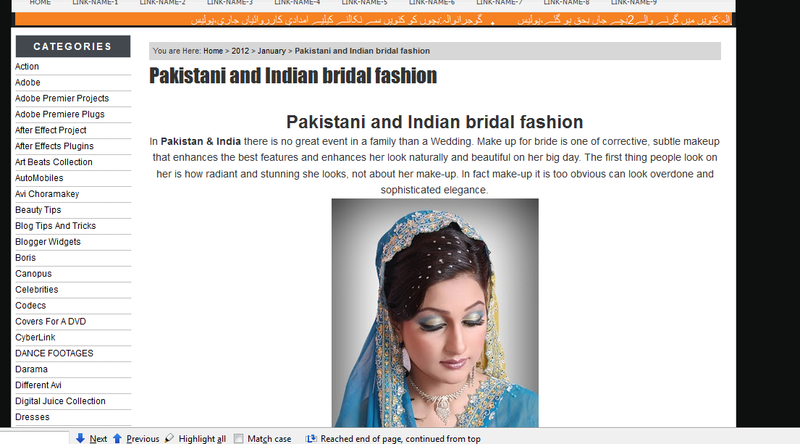 The truth is, I wouldn't mind having the side bar on some of my pages except my side bar seems too large for my taste! Ideally, I'd like to get those little share buttons (even just facebook and twitter and bookmark) and move them to some corner so they don't have to figure so prominently in the side bar and move the archives to the footer where About is - that is attached to nothing, I think. Then i could definitely lose the sidebar on the static pages and I wouldn't miss it one bit. Or just narrow the side bar in general, maybe? Argh! I'm not even sure what I want to do! Suggestions? @GLE: Use the following code. As for your current sidebar gadgets, you can't just move your gadgets to another place by using CSS. I can think of a trick. You need to add duplicates for your gadgets. That means there will be two gadgets of the same kind - one at the sidebar, and one more some other place. Let's call these gadgets #Gadget1 and #Gadget2. Next, you need to add conditional code to hide one of the gadgets from some page. For example, you need to hide #Gadget1 from home page. So in homepage, only Gadget2 will be seen. And then you need to add another conditional code to hide #Gadget2 from all other pages. That means in every page except homepage, only #Gadget1 will be seen. This will give the effect as though the gadget is switching position from one page to another, but in fact there are two gadgets. The only thing I've been able to figure out so far is that the color of the sidebar block that I'm trying to get rid of is #e6f0d3 and that the only instance of that color in the code is ".tabs-widget-content". I can't figure this out! BTW, your sidebar background is an image file. It is not something you can change its color or anything. It has been 'hard-coded' to your template. I overwrote the image file with a plain white color, it should work. Let me know if your default background decides to stick around. Cheers. Insert your page's address accordingly in the code above. @GJE: Have a nice weekend. Cheers. thank you ,, but it's not working ,, i use coolwater templates ..
@Arabic: That's because you're using a third party template. It is impossible to develop tweaks for template I've never heard of, that's why I tend to scope my tweaks to Blogger's default templates. But worry not, I might be able to help. What's your blog's address? I added the code twice to take the bar off two pages. One worked and one did not. The page that didn't is at http://couponterri.blogspot.com/p/community.html. Any help is appreciated. I post the code twice to take the sidebar off two pages. one worked and one din not. The page of the one that didn't work is http://couponterri.blogspot.com/p/community.html. Any help is appreciated. 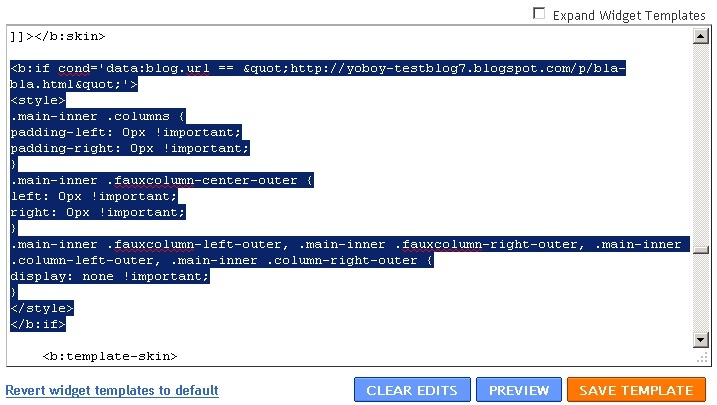 @Terri: Your blogger sidebar has already been remove from the page that you mentioned above - the code did work. The sidebar that you're seeing in that page comes from the embedded code that you've entered in that page. It is not your blogger sidebar. I pasted the code and for this page I want to hide the sidebars on and it did not work. Worked perfectly! I used it on my astore (amazon) page. Thanks!! Hi great tutorial. I have used your tutorials to change the blog. One question, how do I remove the left side-bar for posts and static pages? This is a 4 column blog. Also, would love to put your blog link on our website. Hope that's ok.
@Greens: Glad it worked, and thanks for the feedback. Cheers and God bless. Feel free to include whatever link you want. Cheers and God bless. Thanks a lot buddy. I have put a back-link to your blog. @Prakash: No problem mate. Cheers. @ikui: No problem mate. Cheers. @Marianna: Sorry for my late reply. It seems like you've succesfully removed the sidebar from that page. Are you still facing any problem? But it's not over yet. Your template uses image-background for your posts. As such, you need to edit this image to be large enough to cover your entire page. Or alternatively, you can disable this image on your static pages and let simple colored-background to take over. Let me know if you need further help. Thanks a lot your a genious.. it worked ive been searching for this solution for over 3 weeks..btw is there a way to have a different background image on the static pages from the home page post background?? thanks,, one final thing though.. my background images were originally devided into 3 sections: Header, the middle part & the bottom, as you can see if your on 1 of my static pages i am wondering if those sections could each be visually modified without affecting the home page. p.s im the one designing those BG images. When I got to edit html this does nothing, but when I enter it in the page html format it pushes the side bar down under my footer. I want to remove the sidebar from these pages. It's not working for me, I've tried a lot of the codes you have posted here and it still doesn't remove the sidebars/gadgets from my page: http://www.nickelanddimingwithnikki.com/p/coupon-database.html Can you take a look at it for me when you have a moment? Thanks so much! I appreciate it!! @Beautiful Gaia: Something is seriously wrong with your template. If you need help fixing it, contact me immediately. Go to Dashboard - Design - Edit HTML - Download Full Template - Save the resulting xml file somewhere in your computer. Then go to www.rapidshare.com and upload your xml file there. You will be given a link. Go to this page, and leave your link there. I will get in touch with you via email. @Nikki M: That's because you don't have sidebar in your page to begin with. Do you want to remove the buttons below your coupon frame? I tried the Rapidshare and its stuck initialize... I let it sit for 4 hrs and still nothing. I figured it out, I had to use a different code to remove the widgets from the pages! Thanks!! I'm having problem with this one. It didn't work in blog. Please Help. This is the page where I put the Code and I want to remove the Right Sidebar. It didn't work for me. I want to remove the right sidebar in some of my pages. I already put it and nothing happen. Wow. It did work but the problem is my BlogPost did not maximize itself on the Right. How is this? Wow!! Thanks a lot. it works. @Bernard: Glad it worked. Cheers and God bless. Hello! This tutorial has worked for me, except that the width isn't changing. It's still at 700px. I am using a template that I have customized, and I used your third party template code. The sidebar is gone, but the main wrapper length is still the same. I am doing this for a blog design for someone, so I need multiple pages to be static. Thank you so much! @Emily: Let me have a look. What is your blog's address? @Nadiah: The code I wrote above is to remove sidebar and maximize main column's width on selected pages only. Do you want to apply the tweak to your entire blog, or post pages (the page that appears when you click on a post title) or static pages? Hi friend first I appreciate your hard working..and 2nd: this idea is good and is working very well for me.I want one thing more from you and that is I read your above post where I notice that you mention there three hacks. 1.you can hid sidebar of any static page which you want. 2.you can hide side bar of all static pages at once. 3. you can hide sidebar to all your posts pages. How to hide sidebar of specific posts pages as we can hide sidebar of specific static pages? @Admin: Nicely constructed question. You can hide the said things on specific post pages the same way you do in static pages. Just insert the address of your post page instead of your static page. This worked great!! But now I would like to know if I can narrow margins just for this page? 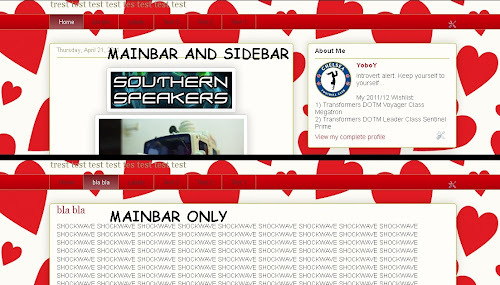 I like the wide width on my blog, but when I place something on the left or right it is over farther then I would like. For example I will be placing three images all in the same row. @Robin: Can I have a look at the page that you're talking about? I'm going to have a "store" on one of my blog pages. So this is how I'm going about doing it, it seems simple enough for me. @Robin: I'm sorry Robin, I didn't exactly get you early on. Let me get this right. You're going to create a static page in the above-mentioned blog, and you're going to remove the sidebars and expand the main posting area's width. Right? I get you till this point, but I'm not exactly sure about narrowing the page's margin, and the image placement problem that you were talking about. Can I have something to look at to get a clearer picture of the problem that you're currently facing? Feel free to create a dummy blog/page for this purpose. I'm sorry, I'm not trying to be complicated. My blog is 1100 wide, to me that is pretty wide compared to most blogs I have seen, I do like the width and will keep it that way. I would like to create one static page without sidebars, and with your code I was able to do that. When I look at this page, my photos are stretched out across the blog page, because that is of course where I set my margins the (1100 I mentioned) But I would like to see my photos closer together, like the left photo directly under the "projects" button. So the margins are wider than I would like for this page. Does this make sense? Perhaps I can only create what I'm trying to do using an HTML table, I have tried that but haven't had much success. @Robin: That makes perfect sense. I can think of two ways. Try either one. Woo Hoo, adding the HTML tag worked perfectly. Thank you again! Hi my friend i try to hide my sidebar in one static page but dont work.please help!!! @Godfather: I can't open the link that you gave. Can you check the address again? I can't believe I haven't seen this post sooner! It worked great on my sidebars. But I also have gadgets below my posts and in the footer, is there a way to remove all of that in my pages too, just leaving the content on my home page and post pages? This hides the sidebar in my "Page Elements" section... please help!!! @Glebber: Did you insert the code directly into your CSS? Whatever it is, just remove/reverse the code. Cheers. Nope! Inserted where you said to! I mean, if I remove the code... it does go back to including the sidebar. But I would really like to use this feature. @Glebber: Well, if you've followed the instruction, you will not lose your 'Page Elements' section. What code did you use? When pasting the code that you've used in here, remove all the '<' and '>' so that you can publish your comment. Okay, so between "]]][/b:skin] and [b:template-skin]"
(I've also tried replacing "data:blog.homepageUrl" with the actual URL... but that didn't work either). @Glebber: That explains it. Were you trying to hide the sidebar from your homepage? Because hard-css tweaks done to the homepage will be reflected on 'Page Elements' section as well. In other words, if you're gonna hide sidebars from your homepage, they're gonna be invisible from your 'Page Elements' section as well. Hope this helps :) Cheers. Oh okay I did not understand this when following the "Remove Blogger Sidebar and Maximize Main Width on Selected Pages" directions! @Glebber: That depends to the gadget. Some gadget adapts to the width of its parent element by itself, and others just don't. But the idea remains the same. Here's an example with Archive Gadget. @Movie raider: You're using an Awesome Inc. The tweak above will work fine in your template. You must have missed a step or something. Be sure to change the address in the code. @Steph: You're very much welcome. Cheers and God bless. @neckerchief: Don't mention it :) Cheers and God bless. Hello! i've done what you suggest every single code. But for me this works fine http://hylintugadi.blogspot.com/p/room-69_13.html but how can i remove the about me below this page only? and leaving only the chat with white background on it. and is it possible to hide the title of this page? http://hylintugadi.blogspot.com/p/room-69_13.html only the title but still appears on page list. Hello thanks for the quick response! Sidebar remove, but the content width are'nt, how to put full width with white background? Hello i've combined the code for the recent inquiry and it works! Thanks again, but one more thing on the lower right theres still a lil unwhited part. How to whiten it? @Marie-France: Use the following code for your page (same instructions as above). If it doesn't work, try removing the hash (#) symbol. I think I followed your directions perfectly but it didn't work. I don't think I'm using a fancy template. Here's the page I'm trying to make side-bar less. @Juliette: No problem at all :) Sorry for the late reply.. Thanks this has helped me so much. I've tried your bonus code but it not works in my blog. i want to remove right sidebar from all pages of my blog. and want to maximize the posts area. Can you please help me on this.. Worked great for me. Pasted just like seen and it removed both sidebars on the one page I specified. Lovely! Your code didnt work, so i took another one and now, my homepage, is ok. But, i want to hide the side in all my pages (static and posts). What i have to do?? Help me! The code above is for Blogger templates only. As I've mentioned above, it's impossible to give one code that will work on all templates. You're using a third party template. One of the codes from the comments above should work in your case. But anyways, looks like you've got this sorted - I don't see any sidebars anymore in any of your pages. Or am I missing something? hi i want to remove right side when i open any post in blog wht i do ? same step above? i cant understand? See the instructions I've given under Step 1 at the top of this page? Follow that step, but use the code that I've given in the comment. and this is for right side wht is the code for left side hide and if i want to hide both then? The Bonus code is not working for me, I want to hide sidebar from all static pages on my blog, any work around for this? Hello. The code doesn't works for me. I made every step and nothing change. Can you help me, please? The blue sidebar that you're seeing (the one that says 'Howdy, Stranger') isn't part of your original sidebar, rather it is a code that you've entered into that page. That code runs in iframe, and you need to go back to the source of that code if you wanna remove that scripted sidebar. Now i want to remove all footer widgets from my blog but am not able to do that . .
You can use the following code to increase the height of your page, but it is not gonna solve your problem. You still need to contact the site where you got your script from, and make necessary changes to it. Right now your script is fixed at 1000px, regardless of your actual page's height. You need to change that. Thanku sir ji . .
Can you pls help me with my site? I don't quite get what you mean. This tutorial is to remove your sidebar on selected pages, and maximize your main content's width. The code that I gave you above should remove the sidebar in your store page (since you didn't specify which page you want to make the tweak to), and it should have maximised its content's width. It has nothing to do with header or footer. Glad your store widget is fitting well in your page :) Have a nice weekend! That is possible. But it doesn't seem like there's any sidebar or posts in your page at all. Have you taken care of them? I have a new page (called forum) and i would like to edit this page so that the right sidebar is visible so that i can add gadgets to it. How can i do that ? Thanks. i did your first advice but i want to resize the forum so that only the right sidebar appears. Hi Dr Ahmad. The thing is, your code is currently placed at the wrong section. Remove the code from wherever it is currently placed, and put it in the post section of your page. That means, you need to go to Dashboard - Pages - Edit your Forum Page - Switch to HTML mode (as opposed to compose mode) - and place your Forum code in there. Once you've done this, use the code in my previous reply to hide the left sidebar and only enable the right sidebar. You are really awesome :) I have made a little modification to your code (i replaced 'right' by 'left') and it worked. I really appreciate your generous help. I've got a blog: free-gadgets.co.nr built on Blogger. Now, I want the sidebar to appear only on the Homepage, and want it totally removed from all the other pages, in a way that the blog content wrapper expands on all the pages except the Home page. Any help you could provide with this? Thanks! Anyways, a nice blog there you've got yourself! Glad to hear that :) Happy bloggin! Having a hell of a time getting this to work on http://www.friartv.com/p/recruits.html. I've tried seemingly every variation you've put up. Any help would be greatly appreciated. Thanks! When you said you'd like to remove the right sidebar from all pages, were you referring to static pages only or practically every single page in your blog (home page, static page, post page, label page, archive page)? THANK YOU for this excellent post, was tweaking the static pages for few hours now according to different other blogs but your code was the first one which really worked !! Thanks again ! After a long morning, it's lovely to see this kind of comments :) You have a good day! I would also like the 1st column to be centered. I've tried modifying code here and there, but I can't seem to get any of it to work. BAH! help please! Yay!! Oh thank you so much! I was messing with code options for the past four hours...and even started thinking to just scrap the template entirely. You saved the day!!! Thank you thank you! LOL.. No biggie :) Happy blogging! Hi Yoga, Is there a way I can eliminate the blank space on the left and right (between the sidebar) of the main text area so that I can give a feel like the Mashable site, also increase the width of sidebar to defaultof 360 pixels ? I searched hard and couldn't find any setting on this very fluid template. This should expand your sidebar, and utilise the gap at either side of your blog. Let me know if it wasn't what you had in mind. Go to Template Designer - Advanced - Add CSS - paste the following code - Press enter after the last character of the last line } - Apply to Blog. Hello Yoga, You are wonderful! Worked like a charm and everything looks fine. I presume I can change the width of side bar by adjusting the 360 px. Now that you have seen my site can I ask you a small trick to slide up my header (which is position fixed) when you start scrolling the page so it gets out of the view. Comes back in normal mode. FYI there is a twitter box slider at the bottom right which does the opposite. I'm not sure if I get that. Are you looking for a way to push up your header while scrolling, or when it is in static mode? Hello Yoga, Thanks for your reply. I mean to push it up only while scrolling so the field becomes clear. Wonder iof there Is anything to hover function for scroll ? The previous code that I suggested should get rid of the small margin at the top of your blog, thus making your header look slightly better. Checkout the screenshot. Many thanks again for your help. I have tried out the css you suggested which moves up the header but hides the CSS menu I have in HTML27. The gap you see is explicitly provided as the header overlaps the menu when someone zooms the page. I have in fact set the Z index of the three elements I have added to the header ( A GOOD lesson from your tutorial not seen anywhere else)vis a vis the SHARE buttons on the left split and the FB Like box and the label menu on the right split under the Adsense banner. Without setting the Z index lower at 6000,5000,and 4000 these elements will hide the adsense and the header when the page is zoomed. You see I had been a good student of a great GURU in extenting the envelope! Can I use the scroll function to hide the header while someone scrolls the page so he can see everything clearly. The header comes back when the page is static? The second: Is there anyway I can set the size of horizontal and vertical space between elements disappearing all together when the page is zoomed so that they don't overlap, like when viewed in an IPAD or smaller screen ? 2) I get what you mean, but I don't see a way forward. The standard blog width is 960px. As long as you plan your blog's width to be within this size, it should be fine in most devices. If this is a major concern, I'd suggest you to decrease the width of your main area. is it possible to remove the sidebar while viewing a specific post? i'm using a template that does not apply the same layout to it's static pages as it does to it's post pages. so i want to make a specific post page look like a static page but i want to remove the side bar and maximize the whole layout so it will look like a static page. I have tried every variation of code on this page and can not get it to work. I have no idea why. I have 2 blogs, one is a 2 column and the other is a 3 column layout. I can not get this working on either of my blogs. I would like a "full width" code for specific static pages for both 2 and 3 column "simple" template layouts. So far, doesn't work. Any idea why? I can't seem to use your contact sheet to ask my question. I have used this code before (great btw), but am now designing a new site using a third party template. I know there must be a code in there overriding this code and wondered if you would be able to help me modify it. The test site I am working on is: www.lb-test-blog.blogspot.com. I have the code for template too if that helps. Thanks. So happy I found your site! Thanks for informing about the contact form. Regarding the tutorial, yeah, it can be done for your new template as well. Do you wanna do it for all your pages or is there a specific page that you'd like to apply the tweak onto? Sorry it has taken me a bit to check back in. Thank you for your reply. I want to do it to all my additional pages so that it only shows on my homepage. Help, please and thanks. I have one static page that I display full width. I had a 2 column setup and it worked perfectly. My blog is now a 3 column blog (2 sidebars w/posts in the middle) and I can't get it to work! I want to hide both sidebars for this page. I've tried all the code on this page, which seems logical..but it isn't working. I'm using the blogger Simple template, simple 3 column layout. Technically, the code posted in the tutorial above should work. If it isn't working, I need to have a look at your blog to see what's wrong. What's your blog's address?